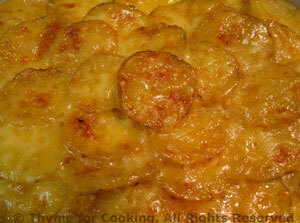 Creamy Potatoes Savoyard, Thyme for Cooking potatoes. Another recipe that I have been making so long the origin is lost. I prefer it to the traditional gratin potatoes. With out the milk and heavy cream it's much lighter in calories, but the Gruyère keeps it cheesy and the onions add another layer of flavor. This makes enough for two meals... or 4 people. Add onions and garlic and sauté until tender and just starting to brown. With a sharp knife or mandolin thinly slice the potatoes. In a glass baking dish just large enough to hold ingredients (I use an 8" X 11" (20 X 27.5cm) oval baking dish) lay 1/3rd of the potatoes, spread half of the sautéed onions over the potatoes and lay half of the cheese on the onions. Sprinkle the nutmeg over the top. Pour the stock over all, sprinkle with Parmesan, cover with foil and bake at 425F (215C) for 30 minutes. Reduce heat to 400F (200C) and continue baking another 30 minutes. Remove foil for last 15 minutes of baking. Remove from oven, let rest 5 minutes, then serve.